I’ve been a devotee of Elizabeth Zimmermann since the day I discovered her work. Given that I didn’t learn to knit until after her death, I’ve got nothing on the hordes of knitters who have revered her for half a century. In fact, it was just about exactly four years ago that I ran across a dog-eared copy of The Knitter’s Almanac at Powell’s and shortly thereafter launched Zimmermania and began Mr. G’s Fishtrap Aran, which is still one of my most prized accomplishments. 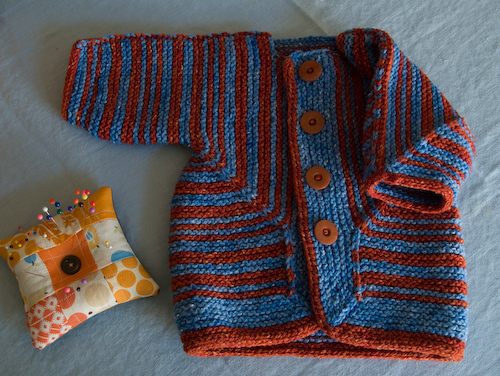 But the first of Elizabeth’s designs that I completed was the Baby Surprise Jacket. I made one for Misa & Morgan’s son that same autumn, and about two years later I made another for their daughter. 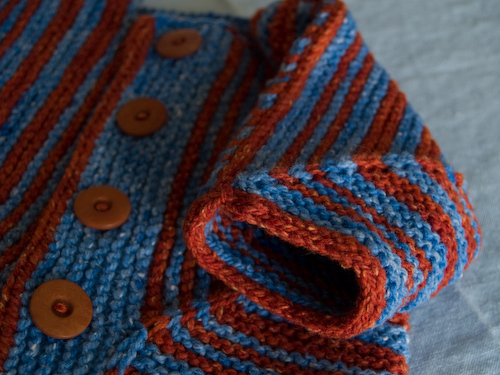 Both these little jackets have been lovingly passed on to other friends with babies, which delights me and assures me that this design is a true classic destined to be appreciated for as long as we have wool and sticks to knit it with and babies to bundle into it. So I could hardly let my own spawn weather its first year unSurprised. 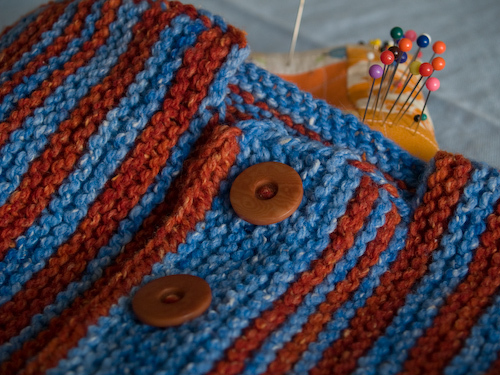 This orange and this blue are Miss Babs’s Cumberland Sport, hand-dyed on an 80% wool and 20% cotton base from Green Mountain Spinnery. 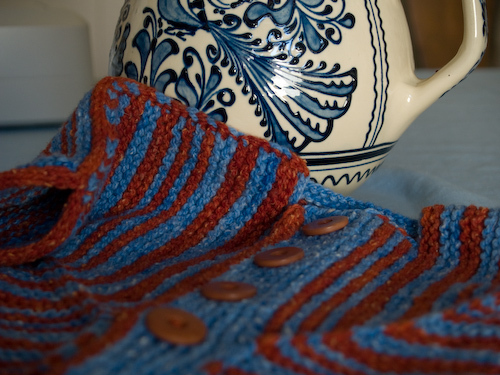 Miss Babs has discontinued the yarn and the remainder of her stock is on sale, which is where that link will take you! * This is good stuff, rustic and tweedy and sturdy and minimally processed, and Miss Babs’s dye process complements the yarn beautifully. 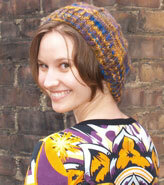 I had Sky and French Marigold, one skein of each. I ran out of the Sky just a few garter ridges shy of where I’d hoped to stretch it, but oh well. Hope you’re having a good weekend! Joyce says to tell you hello! CO 2 and slide to the right of the live garment sts. *K2, yo, sl1, k1, pass over yo and slipped st, return 3 sts to left needle and rep from *. It seems to create a firmer buttonhole, which can be good if your buttons aren’t large enough to be a nice tight squeeze through the regular kind of hole. Anyway, I like it when knitters share their dabblings, so I thought I’d put some of mine up here. But enough knitterly minutia. I love this little jacket and I can’t wait to wrestle my baby’s pudgy little arms into its stripey sleeves. *I’ve been there ahead of you and stocked up on Pewter and Light Turquoise. Because Minnow’s going to need a Tomten for the winter after this one. **More on this little getaway next time. Mr. G took some fine pictures in Ecola State Park. You couldn’t have convinced me beforehand that even gentle hiking’s fairly grueling for the nearly-nine-months-pregnant body, but it was well worth being sore and tired and having extra contractions the next day.